Ages 3 and up. 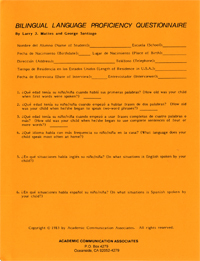 The Spanish/English edition of this parent interview questionnaire can be used to obtain information about bilingual children's development and functional use of a variety of speech and language skills in English and Spanish. Articulation, language, voice, fluency, and the pragmatic aspects of communication are examined. The individual items are listed in English and Spanish on the questionnaire.